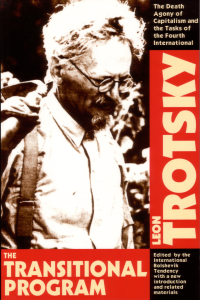 This edition of Trotsky's Transitional Program was published by the International Bolshevik Tendency in 1998 to mark the 60th anniversary of the program. The text is based on the January 1939 version published by the American Socialist Workers Party as edited by Max Shachtman in accordance with the decision of the founding conference of the Fourth International. Discrepancies between the final English version approved by the conference and Trotsky's original Russian-language draft (which had appeared in the May/June 1938 Biulleten Oppozitsii) are noted as well as variants in subsequent SWP editions. The book includes an introduction on the importance of the program 60 years on, and a previously unpublished essay documenting the use of transitional demands by the Communist International in Lenin's time. It also reprints a selection of valuable articles, originally published in the 1970s by the then-revolutionary Spartacist League, on the history of communist trade union work in America from the Communist Party of the 1920s to the SWP of the 1930s and 40s. There are also a number of articles documenting the SL's exemplary attempts to build class-struggle caucuses on the basis of a full transitional program in key American unions in the 1970s. In greeting the founding of the Fourth International Trotsky proclaimed the Transitional Program as his movement's “most important conquest.” Today the Bolshevik tradition which the Left Opposition carried forward remains as relevant as ever.